This blog follows and explains the processes behind interesting geological events. The emphasis is on those events that are energetic, explosive, and have led to, or have the potential to lead to, disasters. This blog provides commentary on interesting geological events occurring around the world in the context of my own work. This work is, broadly, geological fluid dynamics. The events that I highlight here are those that resonate with my professional life and ideas, and my goal is to interpret them in the context of ideas I've developed in my research. The blog does not represent any particular research agenda. It is written on a personal basis and does not seek to represent the University of Illinois, where I am a professor of geology and physics. Enjoy Geology in Motion! I would be glad to be alerted to geologic events of interest to post here! I hope that this blog can provide current event materials that will make geology come alive. Banner image is by Ludie Cochrane.. The photo in this post was taken on the morning of May 8, 2008, by an instrument filming in visible wavelengths on the GOES-12 satellite. An animated sequence and the source of this discussion can be found here. The feature of interest is the long straight line that runs from left to right approximately through the center of the image (more specifically, from WSW to ENE). 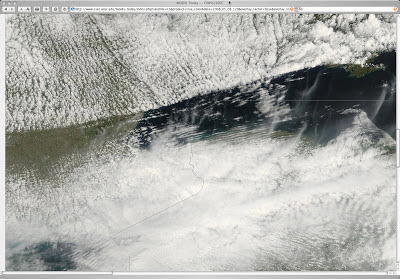 This line extends from the thumb of Michigan on the left, across lower Michigan, through Toronto, and along the northern edge of Lake Ontario. This image (and the movie that was available to the meteorologists at the time) caused great marveling and wondering--what caused that long straight boundary? What caused the cloud-free region? What causes the more subtle straight lines in the clear region? There is not enough topography in the region for this pattern to have been caused by topographic variations. It doesn't appear to be determined by land-water variations. It is clearly more moist on the north side than the south (clear, dry air). During the night before this image was taken, a cold front had moved through causing widespread rain. The boundary appeared after the storm passed. The consensus was that this was an atmospheric hydraulic jump formed when a thin layer of faster northern air discharged into a zone of lower velocity air to the south. The thiner fast layer (presumably laminar flow) transitions through the hydraulic jump into a deeper layer of slower air, presumably more turbulent). Fortunately, data on the temperature and humidity structure in the atmosphere was available from rawinsonde for three stations near this phenomenon. This data showed that there was a temperature inversion (colder air over warm moist air) at low levels, and that the cold air (at the 900 hPa level--I'm not going to try to convert that to an actual altitude, but I think that it's a few kilometers). When a fluid goes through a hydraulic jump, it typically loses its laminar characteristics and becomes turbulent. The turbulence, in this case, would mix in cold dry air that would "dry out" the moister air, producing the clear air downstream of the hydraulic jump. You can also see some fine linear clouds running from WSE to ENE in the clear area. The satellite geeks interpreted these as a manifestation of an undular bore--a gentle form of another hydraulic jump in which there is not a sharp single change of flow conditions, but a gentle oscillating one, often with multiple crests and troughs. If anyone has photos of other atmospheric jumps, I'd love to collect them and post them to the blog--there are very few out there, and some are not available for use because of copyright limitations. What should I call this "snow"? Rimed? Ice pellets? This morning when I went out to early to wheel my trash can to the curb, the temperature was about 25 F (after an afternoon/evening of freezing rain/sleet). The low sunlight was reflecting off a monolayer of brilliantly-shining "snow" on top of the garbage can. The most striking thing about this photo to me is that the pellets, which were a couple of millimeters in diameter, were rimmed with tiny crystals; I think that's what gave the layer such a sparkling brilliance. The only other hint that I can offer is that the trees were all coated with a fairly thin, but definitely noticeable, layer that we would normally associate with freezing rain rather than sleet. I've tried to figure out what to call this snow (ice pellets? rimed pellets?). I should have poked around in the pellets to see if the small crystals were on all sides, or just growing out of the top--oops, big mistake... A quick Google search on "sleet", "ice pellets" didn't turn up any photos like this one! Viewers comments on what to call it and what it says about its history of formation are most welcome! Graupel (also called soft hail or snow pellets) refers to precipitation that forms when supercooled droplets of water are collected and freeze on a falling snowflake, forming a 2–5 mm (0.079–0.197 in) ball of rime. Strictly speaking, graupel is not the same as hail or ice pellets, although it is sometimes referred to as small hail. However, the World Meteorological Organization defines small hail as snow pellets encapsulated by ice, a precipitation halfway between graupel and hail. The term graupel is the German word for the described meteorological phenomenon. Its METAR code is GS. And, indeed, if you Google "graupel" and then "images", you'll find some with the overgrowths like I was seeing above. Mystery solved, thanks to Mr. Lockwood! After a 2-month break while I focused on relaxing, refreshing, and working on my forthcoming book "The Dynamics of Disaster," it took a Science NOW article to lure me back to posting here (i.e., spend some time trying to understand that article, which is really what the blog exercise is all about!). Apparently biologists can measure the strength of a muscle, and have concluded that clams to not have enough muscles to plow more than 1-2 centimeters into the ocean floor. Winter and colleagues took an empty clam shell, filled it with epoxy, and tried to drive it into an exposed seashore, concluding that a clam could burrow no deeper than 2 cm. Why is it then, that clam-collecting, is a rather challenging exercise--the clams shouldn't be able to get away from the collectors. In fact, they can dig themselves into the sand at a rate of roughly a centimeter per second or more. How do they do this? Amos Winter et al. have proposed a localized fluidization mechanism (Journal of Experimental Biology, 215, 2072, 2012). The authors say that the clam technique could be a model for engineering self-burying machines. The physics of the clam defense is illustrated in the frame attached. First, the clam extends a foot, and then it lifts is shell up. The clam, then contracts the shell itself, sending blood into the foot to inflate it and provide an anchor. Then, with the foot acting as an anchor, the clam drags the shell down, a process repeated over and over about every second. Winter discovered the key to the clams success: when it contracts the shell, it relieves pressure on the soil and this pressure change results in water flowing toward the body of the clam. This "liquifies" the sand in the immediate vicinity of the clam. This liquefaction, in turn, reduces the drag on the clam, allowing it to pull itself down. The liquefaction process is local and ephemeral as the water then migrates back into the sand and the clam has to repeat the maneuver, over and over. Clam digging isn't a recreational option in the midwest where I live, but this makes me really eager to try my hand next time I'm at the sea shore! This Blogger is a Happy Camper! If you want to learn a bit of the science behind earthquakes, landslides, volcanic eruptions, tsunamis, rogue waves, cyclones and hurricanes, and tornadoes, this is an introduction that weaves together stories of various disasters--some barely known to much of the world--their causes and dynamics, and some suggested actions we can take to protect ourselves. The book is available both in paper and as an audio CD. Picked by Gone Bookserk.com as one of the "Top Science Books of 2013." 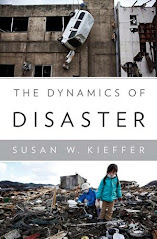 Victoria Raschke's Reviews (Jan. 09, 2019) Kieffer's explanations of the how natural disasters occur is perfectly suited to the interested layperson. The section on rogue waves was worth the price of admission in that it explains something that always seemed kind of supernatural. If you have any interest at all in understanding our living planet and why it sometimes feels like it would be happy to be rid of us, this is the book for you. The Chicxulub impact--What happened on the opposite side of the earth? History of the word "tsunami"